Horno (pronounced Or'-nO) is Spanish for "Oven" or "Furnace". the opening while the horno is being fired. 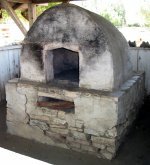 A fire is built inside allowing the thick adobe chamber to absorb heat. After two or three hours coals are removed to a nearby brazier for other use or to reheat the oven as needed. 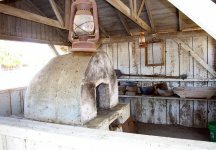 Using a wooden bakers peel, or paddle, the goods to be baked are carefully placed inside the oven and the doorway is sealed. An horno can maintain a useable, though slowly dropping, temperature for several hours. In the case of corn the embers are doused with water and the corn is then inserted into the horno to be "steam" cooked.